The Guest. So modest a title for so boisterous a film. What sounds like it could be a locked room (or house) slasher from Adam Wingard and Simon Barrett (You’re Next, V/H/S) turns into a big, stylish thriller that throws back to classics both you and its creators love. 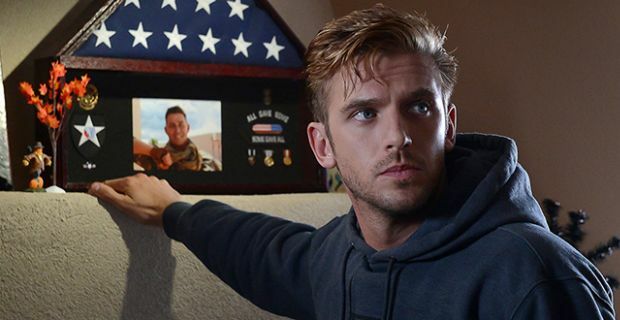 Dan Stevens dominates the film as our titular guest, a veteran who stops by the Peterson residence to visit the still-grieving family of a dead comrade. His beautiful, Bradley Cooper/Captain America visage captivates both the other characters and the audience. Piercing blue eyes, knowing smirk, and a super hero body render all those around him senseless. The homeowners visibly puzzle at this unexpected, perfect guest. Young women and men ogle at him as he steps from a steamy bathroom and lugs beer kegs. He is so much, even as he gives us nothing real at all. He is magnificent. There’s a good amount of Drive in The Guest’s veins. Not only is this film also helmed by a beautiful, taciturn blonde, but it also has a love for hip, retro-chic music and an especially muscular soundtrack. The soundtrack is resoundingly effective, and an instant must-buy (or win, as it was given away to those tweeting pictures of a Guest ticket stub). It is not so visually impressive, but its adventurous camera serves it well, even when its malevolent lingering on Stevens’ face is as heavy-handed as I’ve ever seen. It is also very much not Drive, just as it is not The Terminator, nor Halloween, as much as it may call to mind such films. It is its own film, basking in its influences without being a slave to them. Because of this, there is no shame or loss in it not surpassing these classics. It’s not trying to be them, just an appreciator of them. The Guest stands on its own, and it does so proudly. This movie nodding so many ways creates a number of tones, and they shift abruptly. The hell of it is that it actually works in its favor. Movie and David both are fans of surprises, comedic and dramatic, and the only shift that loses the viewer a bit is a Halloween-centric shift in venue toward the end. The Guest is certainly imperfect, with all characters outside of David and young Anna Peterson being distractingly thin. The reveal of David’s origins falls somewhere between fun, clever surprise and overly-expository spoil sport (I lean towards the former, but it’s a toss-up). It functions so well in the important ways, though. It’s thrilling, fun, and stylish. It won’t be the unexpected hit that Drive was, but that’s not for lack of merit. It’s a big victory for the writer/director team of Barrett and Wingard, whose work has been divisive to this point (and will continue to be so as they remake I Saw The Devil next). The Guest carries on their tradition–self-aware, playful, unconventional takes on the initially conventional–but it stands on its own better than any of their past work. Besides that, it’s simply much better – and I quite enjoyed You’re Next. Wicked and enthralling, The Guest is a movie you need this Halloween. Its violence pops, its twists shock, and it thrills like no other movie you’ll see this Fall. Delivering a lean and mean Dan Stevens to a non-Downton Abbey audience is just the icing on this both trick and treat cake.